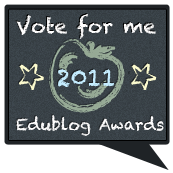 The nominations are up and voting is now open in the 2011 Edublog Awards! Voting is open until 11:59 PM US Eastern Standard Time on Tuesday, December the 13th – and the winners will be announced at the Edublog Awards ceremony on the 14th at 7pm EST (more to come soon). Use the links in the sidebar or the “2011 Nominees!” link in the top menu to check out all of the shortlisted nominees. Instead, our intrepid team of judges combed through hundreds of nominated sites to whittle them down to a manageable number of shortlisted nominations for each category. There is also a generic “vote for me badge” at the top of this post! We’ve changed how you vote this year! Now you can vote for your favorites all in the one location. Just go to the Vote Here link in the top navigation or vote on each nomination page by choosing the category you want to vote in, then who you want to vote for! Easy! And best of all once you’ve vote it loads a page where you can share your vote on Twitter or Facebook! Hello, I would like to unsubscribe from this blog but cannot see how to…please can you advise. thank you. Hi Sarah, in the emails you receive there should be a link. I don’t see the email you used to make this comment as a subscriber, so maybe you figured it out? Thanks! Notice you have one vote per day per category from the one location. Does this mean you can vote once each day for your choices from the one IP address? First, right click on and download the badge from the site. Then you can use this cheats method for adding to a sidebar: http://theedublogger.com/2010/03/23/heres-my-cheats-method-for-adding-images-to-blog-sidebars/ Congratulations! I noticed that some blogs that were nominated, and meet all the requirements, are not showing up in their list. What other reasons might keep a blog from being listed when it was nominated? The main reason was the shear number of blogs nominated in most categories. Things like number of posts, engagement (comments, subscribers, RTs, etc) were all considered. For specifics, feel free to email us at 2011eddies@gmail.com and we can take a look. Wow! I’m blown away to have made the short list in 3 categories! Thanks! It’s not really a typo, but I noticed that in the Most Influential Post category, I’m listed as “Thomas Hobson” instead of “Teacher Tom.” I would prefer to be listed as Teacher Tom since that’s how most of my readers know me. Pingback: Voting is Now Open for Edublog Awards! Support the SLPs! Delighted to be shortlisted in the class blog category. Equally delighted to have an Edublog badge for the blog but when you say ‘link back to the poll’ what do you mean? I can embed it in the side bar but don’t know exactly where you want me to link back to. To whom can I email to lodge a complaint? Hi Ned, all blogs and websites are nominated by people using a two step process. They have to write a post with a public nomination of who they would like to nominated and which category they are nominated in then submit a link to their post. Very happy to have been nominated. Thank you to whoever it was that nominated my blog.